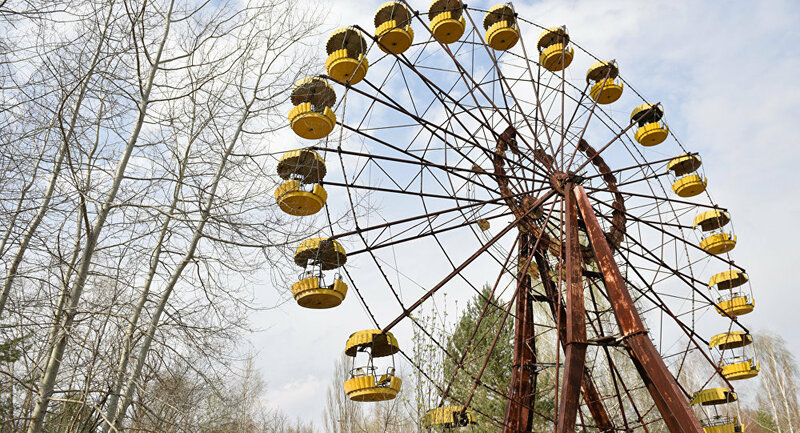 A creepy video recently published on YouTube shows how a Ferris wheel in the abandoned Ukrainian town of Pripyat that hasn't worked for over 30 years was thrust into motion. The mechanism was reportedly launched by Polish tourists that came to visit the town located in the Chernobyl region. The author of the video depicting a Ferris wheel in the empty Ukrainian town of Pripyat located within the Chernobyl Exclusion Zone said that the wheel was launched mechanically, without electricity and assured that no mechanism had been damaged as a result of his and his friends' actions. However, his statement is unlikely to stop local authorities from filing a complaint. A local state agency that is in charge of controlling the Chernobyl area has expressed outrage over the "scandalous" behavior of the Polish tourists. The authorities want to initiate a case against the wrongdoers, being confident that the launch of the mechanism could have led to human casualties. Pripyat is an abandoned town in northern Ukraine, located near the notorious Chernobyl Nuclear Power Plant. The town was evacuated on April 27, 1986, following the Chernobyl nuclear disaster. The Exclusion Zone is viewed as relatively safe, as radiation levels in the region have dropped significantly since the catastrophe. Several Ukrainian tourist firms even offer guided tours around the territory.